Well, if I was a rider with, say, a bladder condition or claustrophobia, I'd say it would definitely qualify as an emergency. The Citizen article pointed out that Bell Canada did apply for the proper permit to perform its work. 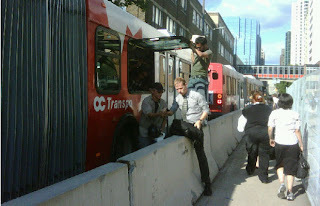 The permit was granted, but nobody at the City saw fit to inform OC Transpo. What the Citizen doesn't say, and I'd be highly interested to know, is whether it was absolutely NECESSARY for Bell to perform the work at rush hour in the middle of the already chaotic situation created by the construction on downtown Transitway stations.